We believe climate change is the single biggest threat to human welfare. Humans are raising the Earth's temperature by burning fossil fuels like coal and oil which creates CO2, a gas that strengthens the greenhouse effect. If we continue to increase our greenhouse gas emissions at current rates for only two more decades, we are unlikely to keep the temperature increase by the end of the century below two degrees Celsius. This would result severe droughts, famine, heat waves, stronger storms, floods and sea level rise. Before this century is over, millions and millions of people all over the world will in some way be hurt by our use of fossil fuels. A warming of more than two degrees could also kick start huge, natural, negative spirals that would further drive up temperatures and intensify the damaging impacts on society. In order to avoid this, we need to significantly reduce our greenhouse gas emissions, starting immediately. We are looking for projects that will help us achieve this goal. 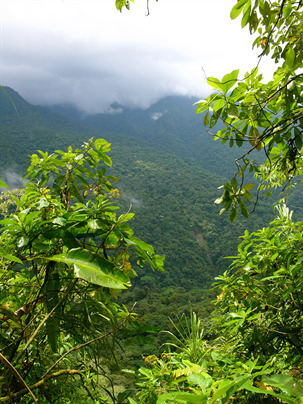 For how long will we be able to see these views of healthy rain forest?